Irregular verbs are an evergreen in TEFL. There are a lot of them and students have to memorise them. There seems to be no way around it. However, I still try to come up with something that will make this hard work easier for my students. And this time I try to teach 31 irregular verbs in two lessons using simple rhymes. In this post you can find a worksheet with the short rhymes, an interactive quiz where students can practise their knowledge of irregular verbs, an interactive game and a worksheet with two exercises. I hope you find the activities interesting, useful and effective. Start the lesson with the following rhymes. The verbs are organised into rhyming sets and a simple short story is added. This should help the students remember the irregular verbs. 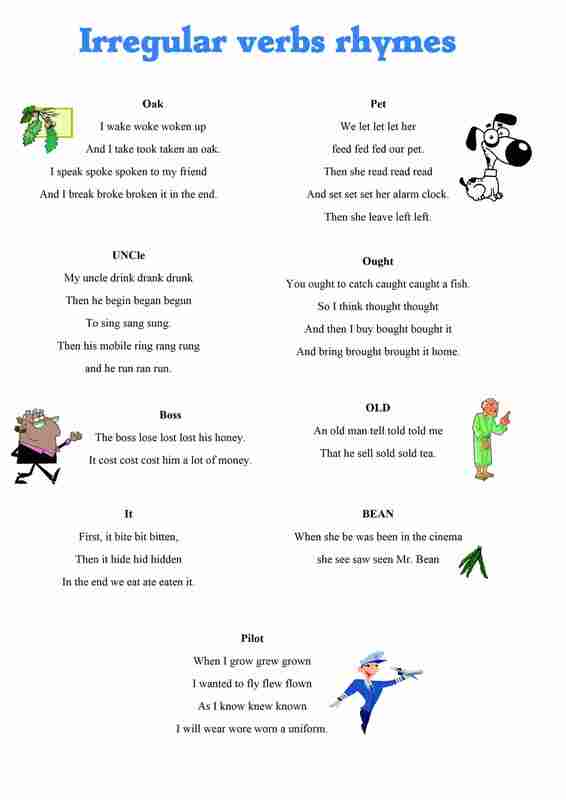 In the lesson, ask the students to read the rhymes aloud. Then translate the stories and tell them to memorise 4 of them. In the following lesson check that they have learnt the rhymes and ask them to memorise the rest of the rhymes. In the first exercise students should complete the mind map with the verbs they remember from the rhymes. They have to write the verbs only on the branches belonging to the appropriate rhyme. Check their answers. In the second task students have to write the past tense and past participle of the verbs given. The following quiz can help your students practise the irregular verbs either at school or at home. The quiz consists of two parts. In the first part, students should write the past tense and the past particples of the verbs. In the second part, students have to drag the correct verbs into the sentences. The students will be rewarded with a game after each part of the quiz they pass. The quiz is in HTML5, so it will play on all desktops and mobile devices. I think that your students will love usind the following game. Their task is to click the correct past tense and past participle. While the first round is easy, the others are very difficult indeed. You can find a list and several interactive activities at British Council site. Which post on irregular verbs is the best?